LinkedIn Event with Paula Cohen- Next Thursday, March 4th!! 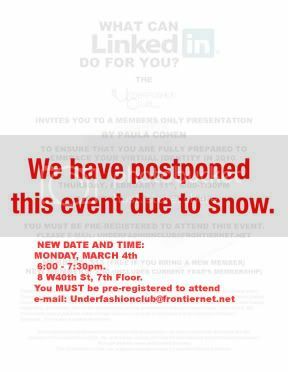 Just reminding all of you fashionistas out there to register for the LinkedIn presentation with Paula Cohen on March 4th, 6:00-7:30pm held at 8 W40th St, 7th Floor. You MUST be pre-registered to attend, and there’s only a few days left to do so! You guessed it….. More Femmy! Underfashion Club got featured! Check out these featured articles in US Weekly, CupidIntimates, Life and OK! Magazine about this years Femmy Awards and presenters! Upset you didn’t get in on the live Femmy action? Pictures just not “doing it” for you? 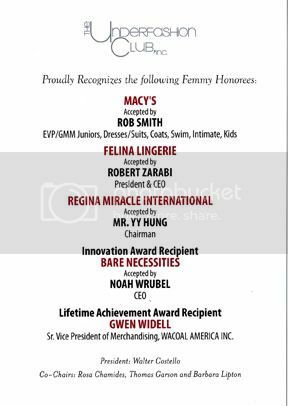 Well,all you cats in Fashionista Land, don’t worry your pretty little heads because the official 2010 Femmy Gala Video is up! Again, we at Underfashion Club want to thank all those who attended and can’t wait to see you all again next year!! Femmy Awards 2010 Video and Pictures!!! This years Student Design Contest was “Femme Fatale”-inspired by ’20’s to ’40’s Film Noir. Check out the pics from the Underfashion Club Femmy 2010 Awards Ceremony!!! Again, a big Thank You to all those who attended and Congratulations to all our contestants, finalists, and this years Student Design Winners! 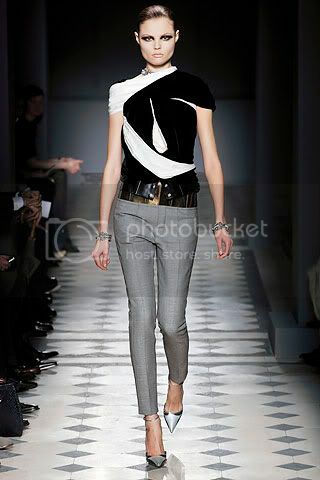 Are you keeping up with MB Fashion Week 2010?? Hello out there to all you ladies and gents in Fashionista Land! Just wanted to make sure you’re all keeping up with this years Mercedes Benz Fashion Week NYC! We’ve included some links in this post to help you stay up to date with this years trends, designers and the latest news right off the MB Fashion Week newsroom floor. Enjoy and we’ll see you on the runway! Stay tuned for links to view this years Femmy Award Winners Designs on Youtube, and don’t forget to friend us on Facebook!! 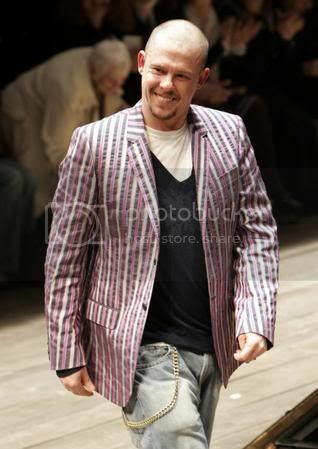 Underfashion Club would like to extend its condolences to the family and friends of Lee McQueen, designer and founder of Alexander McQueen. Your creative ingenuity, bold statements and presence in the fashion industry will be sorely missed. The remaining three finalists … Stephanie Arrue, Lauren Keates and Christina Lord were awarded $300 each. Congratulations and big thanks to all those who competed and attended!! Stay tuned for more information on MB Fashion Week 2010!! Fasten Your (Designer)Seatbelts! It’s Fashion Week!!! So hopefully all you fashionistas out there caught the Spring 2010 Fashion Week this past September, but if you didn’t, you can get an early start on your Fall fashion by checking out this years NYC Fashion Week. Fashion Week, a twice a year event, is held in late summer (September) and early spring (February) to showcase its respective upcoming Fall and Spring Collections. Sponsored this season by the one and only Mercedes-Benz, this years Fashion Week will be held in Bryant Park (42nd and Sixth). The 8-acre park will be tastefully converted to a temporary fashion tenement. These grand scale tents contain several different venues for the designers to show their collections, and they’re climate controlled to boot. This will be the last Fashion Week held in Bryant Park, as it is planning to move to Lincoln Center this upcoming Fall. The in-tent venues (which can range up to almost 12,000 square feet) contain all the ingredients needed for a successful fashion show: A runway,, backstage areas, attendee seating, lighting booths and sound. And as wonderful as these accommodations are, some fashion designers still choose to have their collections shown in showrooms or other off-site venues during the week. Unfortunately, fashion week is not open to the public as it is attended by journalists, editors, buyers, public relations and management companies and celebrities; all whom have sought accreditation months before the event, so, sorry kids, you’re gonna have to watch from your respective social media outlet. Shows are indeed invitation-only and each fashion designer is responsible for their very own guest list. Lucky for you though, there are plenty of social media sites that offer full coverage of the event. And if you want to get directly in on the action, check out the MB Fashion Week schedule , designer index, or follow them on their Facebook. You can also check out NYMag’s Fashion Blog “The Cut” on Twitter or on NYmag.com’s blog hub for up to date action and excitement.